It is late afternoon, and most of the men have gone out to hunt the Burchell’s Zebra. I am talking to my guides, Isabel and Hendrik, and the three of us agree that it is time. We pile into the truck with only the equipment that we will need for the hunt. Hendrik is driving, I am sitting in the front seat, and poor Isabel is perched over the stick shift. She jokes that it is the most comfortable seat in the truck, and we drive off. I am the designated gate opener, and I hop out to let the truck pass through several locked gates. I am slow at the gates and Hendrik teases me, saying that when I get really good I will be promoted to riding in the bed of the truck, just like the farm hands. We travel deep into the desert, looking for just the right spot to begin our hunt. This afternoon the desert is cool and dry. It is mid-May, already becoming winter in the Kalahari. The tall dry grass is all there is to remind us that this had been a wet summer. Food is plentiful for the antelope; but the tall grass is also excellent cover for the big cats. I am watchful of the dangerous shadows of the Kalahari. As we drive, a herd of Kalahari Springbok bound away. There are Gemsbok everywhere, and Giraffe in the distance. Under a Camel Thorn tree is a little Duiker. We hear a shot from far away; later we will learn that the Zebra is down. colored sand is brilliant in the late afternoon sun. I see nothing – no tracks, no sign of our prey. But Hendrik’s eagle eyes have picked up a clue. Isabel says that he is an excellent tracker. She is sure that we are in a good spot. We take our gear from the truck and set out on foot. Seconds later the cry goes out. Tracks in the sand! Isabel shows me the tell tale sign. The sand is cracked ever so slightly, like a loaf of baked bread. We get down on our knees and dig with our hands. An inch or two below the surface we find our prey. ¡Nabbas! - A most delicious truffle, found only in the Kalahari, and only in the early winter following a good rainy season. I am indeed lucky, to be at the right place at the right time. I know of no other hunter with so rare a trophy as this! One of the best-kept secrets of the Kalahari is the African Truffle, Terezia pfeilii, also known as n/abba, mahupu, sand-potato or knoll. We accept this special and different kind of hunting story from the author who had the great opportunity to experience such a "hunt" herself. To go truffle hunting in the Kalahari doesn't require the sensitive snout of a pig or trained dog - just sharp eyes to spot the fine surface cracks that mark the underground presence of this superior puff-ball. What`s long seemed a mystery, though, is that this desert truffle may appear in abundance one year and then not show up again for years: it all depends on the weather. We've had years of good rains, and then no truffles. It has to be the right amount of rain, on the right time. But still it remains a mystery-speciality of the Kalahari nature. What a successful hunt! Almost like following a treasure map no on else has found and being the first to discover the reward! As I read your story anticipating the final outcome and finding it was truffles, I could picture in my mind Tienie cooking them on her outdoor propane grill with some nice gemsbok for lunch! What a great memory. I love a good sense of humor. Great the way you disguised the "actual hunt" until the very end. You brought a smile to my face. Thanks. I was reading and thinking that you were looking for some animals to hunt. When I got to the end I had to laugh as it was mushrooms that you were on the look out for! As well as the big cats! I took a Mycology course in college. Afterwards I would eat Puffballs on the golf course and made a Pleurotis(Oyster) mushroom pizza from the forests of Central Wisconsin. Fungi have always fascinated me. With the Kalahari truffles I would sautee in butter fresh poultry giblets(sand grouse hearts in the Kalahari), onions, garlic, mushrooms(Kalahari truffles), salt, pepper, a lot of fresh sage. This mixture would be added to wild rice and brown rice and chicken stock. The mixture could be baked as it is or smothered over poultry such as pheasant or chicken breasts or (sand grouse in the Kalahari) to keep them moist. A bottle of Chinook Cellars Merlot from the Yakima Valley of Washington State or Santa Barbara County Chardonay from Fess Parker Vineyards in California would complete the meal. Of course, South Africa has some excellent wines, also. 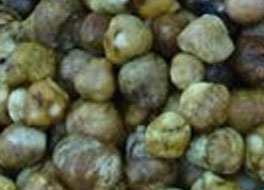 It is written that the Kalahari truffle rivals the quality of the truffles of Italy and France. I am going to the Kalahari in May of 2009. I would like to find some truffels. I would cook them with Gemsbok cutlets in a South African Merlot reduction over wild rice from the Great Lakes region of North America. I bet the truffels cooked by Isabel were wonderful. What a rare gem of a story! The surprise ending is superb!